I once sold carpet and flooring and one of my customers in Nashville was a man who designed voting tools and booths for the entire nation. I noticed on his wall the photos of presidents from Ike to Nixon, to Reagon, Bush, and then Bill Clinton. I asked him about the sudden change and he told me he had once been a Republican and even held office in California. He observed GW and the Republican Party damage voting boothes in Texas where there was a heavy Democratic vote, and road blocks to intimidate people trying to get to the polls. He said this was the dry run for what later happened in Fla. He explained that the voter cards had to be punched for the candidate you wanted. The Republican Party filed down the length of the punch pin so it would not reach thru the card. This is what caused the controversy of dimpled chads and hanging chads. The punch pin would not punch cleanly all the way thru the voting cards because they were filed down deliberately. He showed me the shiny tip of one and said it would not have been shiny it would have been dull if it had worn down thru use. This time they are robbing far more people of their right to vote using far more efficient tactics. This could easily set up the perfect scenario for a complete uprising. There is the real voter fraud, but it obviously comes from GOP operatives, as noted here and in the decision of Virginia’s AG not to prosecute the registration worker who threw specific voter registration forms into a dumpster. Clearly, that action was illegal and a violation of election law. All these tactics to deny voters the franchise are disgusting and unAmerican. They sully the values and standards for which America is known. They say that the US is no better than the most corrupt third world countries around the world. Perhaps my pride in our country – our democracy – is too great. But I do believe America is – or can be – that “shining city on the hill”, but it will not be so if elections are rigged to deny people the most basic of all freedoms: the right to vote their conscience. If for no other reason, American voters, if they really care about our democracy – its ideals and what those ideals mean, should deny the GOP their votes. Not voting for the GOP will send a loud and clear message that we Americans do not approve of our franchise and votes being manipulated. It will say we believe in a free and open society in which all Americans matter, regardless of political stripe or other factors, as many of our founding fathers believed. American patriots do not deny the vote to other Americans! The Democratic National Convention begins this evening. There is little doubt by those who have read my blog posts over the years that I have sustained values inherent in our own Declaration of Independence. It took us nearly two hundred years to achieve equal rights and opportunities for all our people, from the right to vote regardless of income, gender or skin color to the right of women to demand that they be paid the same salary as their male counterparts for doing the same job while having the same commitment to the job. Even though our Founders never imagined this day ever arriving, it is in the very nature of humanity and democracy – democratic values – that inclusion and opportunity arise and grow. Look back in the far distant historic past to the tribal communities of the Danes, the Britons, and the Celts. The leader was elected because he represented all the tribe, all the community. Everyone, including women, had a vote. And women were held in high esteem, not just as mothers but as the future of the community, the holders of history, and the healers. The Wise Woman was revered and loved and her thoughts were valued. But the Roman world overwhelmed the commonweal of those communities and utterly destroyed those rights, and even the value, of women – a destruction that lasted until the 20th Century. Now, women have regained those ancient rights. Just as everyone, regardless of color, religion, or ethnicity or any other designation, has attained their full rights as human beings. The modern Democratic Party, post the Civil Rights legislation under LBJ, fought and attained these rights for all our people. I’m an old gal now so I’ve seen the positive changes the modern Democratic Party wrought in my lifetime. I remember my mother telling me that I would never attain a successful business career because men would never let me. I remember being told I should settle for a teaching or nursing career and never hope or dream of something better because I’d only be disappointed. I remember when I said I wanted a college education being told my brothers came first because they were male. I remember being told that I should settle for my lot in life as a mother and wife…and not hope for or expect more. I refused that advise to retire at a company director making many thousands more than I would have if I had followed that advise. I was able to encourage and inspire my daughters to be all they could be. Now they surpass me in income, in self-sufficiency, and most importantly in their belief in themselves…and they have happy loving families. I remember living in the Old South prior to Civil Rights when my father’s accidentally turning down the wrong street struck fear into the hearts and minds of the residents of that Black neighborhood. I remember the children, still dressed in their faded but clean Sunday clothes, stopped their simple childhood games to stare at us with fear on their faces. I remember a neighbor woman telling my mother that Black people simply did not want to work, regardless of the fact that the only work available to a Black person was housekeeping and cleaning, yard work, or collecting the garbage. I remember being told in that deep pre-Civil Rights South that Black people didn’t have the intelligence or ability to do well in school or create successful businesses or achieve broad-based political leadership. Worst of all, I remember being told, as a very young child, that I couldn’t play Black children because doing so would make me sick with diseases that were endemic only to Black people. I never believed those lies, and in college I learned how completely and utterly false those many lies were. I remember being told by my parents who had suffered through the Great Depression as children that anyone who was Jewish or of non-European, WASP extraction that those people were not Americans…that they didn’t deserve the same rights as we did. But we changed those outmoded, restrictive ideas. We argued and fought for rights for all people. We chose progress towards more humanity, towards more inclusion, towards more human rights for all people, towards more equality. Today, we are in another great fight. It’s not just a fight over civil rights – who has the right to vote and equality of income – but the fight of over opportunity. The GOP today, against its Lincoln, TR, and Eisenhower heritage, would have us believe that the most wealthy in the country need to be protected not just from taxes but from their responsibility towards their country…the country that has given them so much opportunity and freedom to create and live their dreams. Where would Romney be without a country that gave his immigrant father so much opportunity? Where would Ryan be without Social Security after his father died? Where would JFK and so many other politicians be today were it not for the opportunity this country gave their poor immigrant ancestors? The US opened our lands and eventually our hearts to those who came here seeking a better life for themselves and their families. That is the American dream in action. Yet, when I listen to the GOP today, I no longer hear those iconic dreams and values espoused. I no longer hear Thomas Jefferson’s Declaration of Independence in their words. I no longer hear the words and deeds of Abraham Lincoln or of Texas’ own Lyndon Johnson. I believe America can be – and should be – better than the modern GOP espouses, just as my ancestors who left England and Ireland in the early 17th and 18th Centuries for the wilderness of America believed that opportunity should be better for the non-wealthy and politically well-connected. My ancestors not only believed that their own hard work should be rewarded but that community – the commonweal – was necessary to their health and well-being. As John Donne wrote in the 17th C., “no man is an island.” We all need each other to survive and thrive. We all need government to provide the rules of the road so bad actors don’t harm the rest of the commonwealth. We all need government, at whatever level, when the exigencies of life throws us a curve ball or strikes us out. We need the commons, just as our ancestors who moved to the plains depended upon their neighbors and townships to help them in difficult and good times. We need the sheriffs (government) to protect us from those who would take advantage of us and cheat us or to mobilize the commons to help us get back on our feet to move forward again in our lives. This country has been great for my family. We came here with nothing, having left everything behind in Europe. We homesteaded and with the help of our communities built prosperous businesses and prosperous farms. We succeeded in so many ways. We moved West in Wagon Trains and by railroads. We started new businesses, made fortunes and lost them. But all along the way, it was community – the commons – that helped us succeed. The United States has never been about “me, myself and I.” It has always been about “us.” One nation indivisible. Yet, today’s modern conservative movement within the GOP seeks to deny the “us” that made America not only strong but invincible. By working together as one community, regardless of the forces that seek to drive us apart or return to an economically fatal feudal society, America can continue its legacy of being the guiding light for the rest of the world. To return to the days of the latter 19th Century when wealth decided elections, public policy and worker rights as well as taxation policies, as this new conservative movement espouses, would negate the very premise of the United States our ancestors left their homes for. It negates Republican TR’s legacy. It negates Eisenhower’s beliefs. It negates very the ideals of Jefferson and Madison. Even the iconic Reagan would be distraught at the extreme’s to which this GOP conservative movement has gone to preserve and expand the rights of the most wealthy at the expense of everyone else. He said as much in his speeches during the tax debates of the 1980s. Ronald Reagan’s tax policies were diametrically opposed to those put forward by Ryan and Romney. So, as I sit here tonight watching the Democratic Convention after having seen the Republican Convention, I cannot but help feel the weight of all those ancestors who came before me: their struggles to start a new life, their fears and flights from homelands that sought their deaths, their fight to create a new nation and to preserve it against all odds for more than two centuries, and their hopes in creating a new commonweal. The weight of their history hangs heavy on my shoulders. But I will not let their – or the millions of others who fought for freedom – hopes down. I will not succumb to irrelevance and apathy. If we want a better country…a country that leads the world in business and educational competition and human values…we have fight for it now as never before in our lifetimes. We have an obligation to the future. An obligation to future generations of all American citizens, regardless of color, race, religion, ethnicity or gender. We have an obligation to fulfill the demands of the Declaration of Independence and the dreams of our ancestors. That is what this election is about because the visions between the modern GOP and the Democrats is that large. 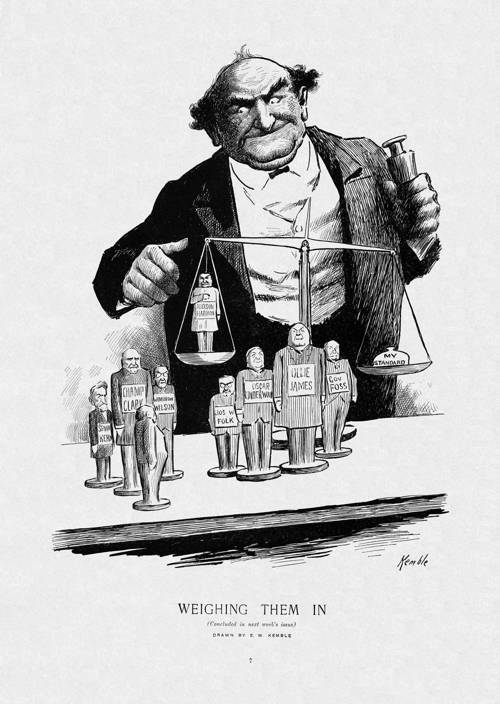 We can choose to return to the late 1800s Gilded Age of Robber Barons that erupted in violence and nearly destroyed capitalism, or we can choose to avoid those pitfalls again by moving forward to build a better society for all citizens as TR chose to do with his early 20th C. policies and FDR expanded upon a mere two decades later. As I said, I’m an old gal. I heard the stories from my grandparents who crossed the plains in covered wagons and early transcontinental trains. I researched their family histories going back to the Religious Wars from the 15th through 17th Centuries that devastated much of Europe. I learned of their travels and travails in coming to America and how much they needed and relied upon the commonweal for their survival. I learned of their movements across the country and their hopes, triumphs and re-creations. But the more I studied – the more I learned about how much they depended upon their communities, not just themselves – how they created successful lives, including very wealthy careers as well as how much they depended upon government, including the federal government, the more I learned how the commonwealth helped them. I learned more than anything else how much our ancestors depended upon each other to survive and thrive. How much we chose to progress towards the equality of opportunity and freedom that Jefferson, Madison and Hamilton wrote about more than two centuries ago. Above all else, we need to once again adopt the commonweal that has been the primary foundation and sustaining influence of our country since our earliest immigrant ancestors. Without that attitude of “we are one people in this all together” regardless of wealth or talent or ability or any other outward attribute this nation cannot survive, compete and grow as it has in the past. We are all the children of immigrants, regardless of when our ancestors arrived on these shores, and we slowly learned to incorporate the words of Jefferson’s Declaration of Independence into our deepest feelings and beliefs. The “shining city on the hill” is, in fact, a nation of equal opportunity for all citizens, regardless of all other factors, which requires the commonweal. Conservative writer for the Daily Beast Andrew Sullivan, who left the new conservative movement during the Bush years as result of Bush’s outrageous spending, wrote on his blog what I only wish I had. Romney is knowingly arguing that the spending and debt levels of the last three years were some kind of choice by a president who just loves to strangle the US economy by spending much more money than we have. But the only president who made that choice was George W. Bush – by crippling revenues, even as he fought wars with no budgets and new entitlements with no end (Medicare D), rendering us bankrupt even as we desperately needed a rainy day surplus to fight the depression. Obama did not have a serious choice; he had a fate. That fate was to pick up the pieces of the most catastrophic presidency in modern times. The final bouquet – after emptying the public coffers with no serious boost to employment, profits or growth – was the financial collapse, which both shrunk the economy, decimated revenues to 50 year lows, and automatically increased spending for the unemployed and poor in desperate need of help. Once you account for that – and the [MarketWatch] Nutting graph indeed shows that this was baked in the cake by the time Obama was elected – Obama has been, like most modern Democrats, far more fiscally conservative than any modern Republican. There are legitimate issues to debate with respect to the future in this election. But the caricature of the last three years, the knowing lies that interweave with this false narrative, the attempt to describe a pragmatic, sane and successful president as somehow unqualified to tackle this mess – when the US economy has fared better in this period than much of the West – are deceptions, exploiting pain. I’m sick of them, and the cynicism they represent. Read all of Sullivan’s blog post because he’s absolutely correct. If you want a better, more effective government, you have to hire people who understand the problems and challenges, who are willing to tell the ugly truth and not pander to a misinformed base. Certainly, John McCain showed more courage and honesty during his campaign for President than Romney has or ever will. I agree with Sullivan and Fumento which is why the radical right must be soundly defeated in the upcoming election. Micheal Fumento worked for Reagan and wrote for National Review. But, he writes, the new hysterical right cares nothing for truth or dignity. In a long editorial on Salon.com, Fumento not only explains why he’s left the conservative movement but what is wrong with it. The entire editorial is well worth the time spent reading it. Then, ponder the French Revolution vs the American Revolution. Because the angry, hate-filled French peasants, encouraged by those who hoped to use those emotions for their own benefit, had no constructive goal in mind, they knocked down, destroyed and pillaged the nation. Destruction for its own sake to slake the anger and hatred of the populace. The American Revolution, on the other hand, never went down the path of utter destruction because there was general consensus, on both the conservative and liberal sides, to build a new government and country. Anger and hatred were put aside to build, not destroy. As one nation, do we really want to continue down the path of tearing each other apart; of screaming “j’accuse” at those who disagree with our political beliefs; of fear, anger and hatred? Or do we want – choose – to come together to resolve the major challenges that have been building for more than 30 years?